Skin (body): Multifocal to coalescing proliferative and hyperkeratotic dermatitis. This image shows the dry, or cutaneous, form of avian pox. There are many pox lesions along the dorsum of this table-egg layer. Pox lesions typically develop on the head and legs however, in rare cases, they may extend into other regions of the body. The lesions are cutaneous nodules of epithelial hyperplasia arising from of the epidermis and feather follicles. 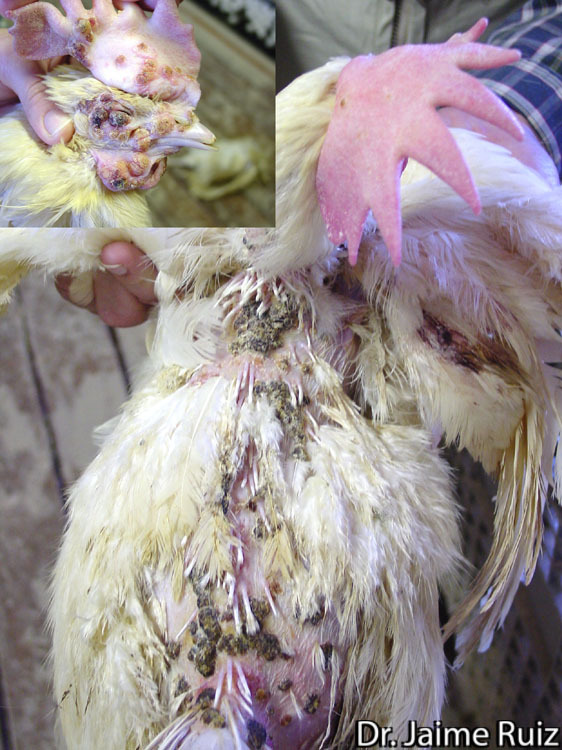 The skin of the body, face, wattles and comb of these chickens is covered by multiple, well-demarcated, regionally coalescing, raised, dry brown masses. The majority of the masses are brown-grey, covered in flaky material and have a crateriform surface. Some of the masses on the unfeathered skin consist of superficial regions composed of brown flaky material, surrounded by smoother, paler raised tissue and a few of the masses are delineated by a thin rim of red tissue. The lesions on the face impinge on the eye and nare.